Having Kim Darnell working on the Switzerland and Swiss things Page has tossed me into a pit of Swissness, from which I might not emerge for months: over a dozen Swiss and/or Zwicky topics for posting have popped up in the last few days. Here’s one that appeared when I started investigating Swiss cheese, the name of a specific American cheese somewhat remiscent of the Swiss cheese (in the fully compositional sense of the nominal Swiss cheese) Emment(h)al(er). That brought me to a list of Swiss cheeses ‘cheeses of Switzerland’, including Gruyère, raclette, Appenzeller, and — sudden rush of memory — Schabziger, which I know under its American brand name Sap Sago. The cheese of Canton Glarus, where the Zwickys come from. A hard, green frustrum of a cheese cone, colored and scented by an herb, used grated like parmesan or Romano. 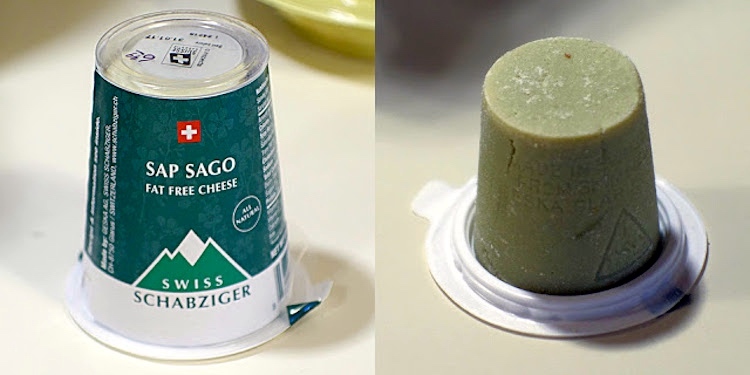 Schabziger [schaben ‘to scrape, grate’ + Ziger ‘whey cheese’, hence ‘grating cheese’] or sapsago is traditional cheese exclusively produced in the Canton of Glarus in Switzerland. Schabziger is made out of the skimmed cow milk and a special kind of herb, blue fenugreek (Trigonella caerulea), also called blue melilot. The milk and melilot sap are heated to 32 °C (90 °F) then an acid (lactic, citric or acetic) is added causing curdling. The whey and curd are separated. The whey is further curdled at 90 °C (194 °F) and separated. The whey-condensate is called Ziger and is pressed into cones for 6 to 8 days. The cones are then dried for 2 to 6 months. The resulting cheese is hard, green with a strong flavor and aroma. It is usually conditioned as cones of 100 g (3.5 oz) with a height of 5 cm (2.0 in). It contains less than 3% fat. Schabziger is usually eaten grated, or mixed with butter to make an herb spread (“Ankeziger”, “Zigerbutter”) that is put on bread or sandwiches. It can also be used in fondue (Zigerfondue) [this is Switzerland, so of course there’s fondue], or grated and eaten with noodles (Zigerhörnli) [this is Swtzerland, so of course there are noodles] or rösti [this is Switzerland, so of course there’s rösti, which is, roughly, Swiss hash browns]. A cone of Schabziger can be conserved for weeks [in my experience, months] in the fridge [or any cool place]. Schabziger is produced exclusively by Geska (Gesellschaft Schweizer Kräuterkäse-Fabrikanten). 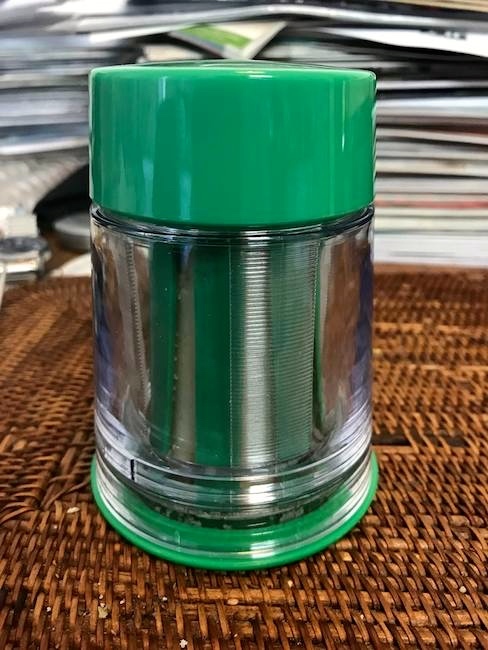 It is sold abroad under the name Swiss Green Cheese. In the US it is also sold under the brand Sap Sago. Sap Sago was introduced into New York pharmacies in the 19th century. The name is a corruption of the word Schabziger, … though folk etymology has it that the green herb juice used made to make the cheese was called “sap”, as in tree sap [eggcorn alert!]. I haven’t had it in years. Columbus OH used to have a cheese shop that carried it, and Ann Daingerfield Zwicky and I used it in cooking. But that was a long time ago. 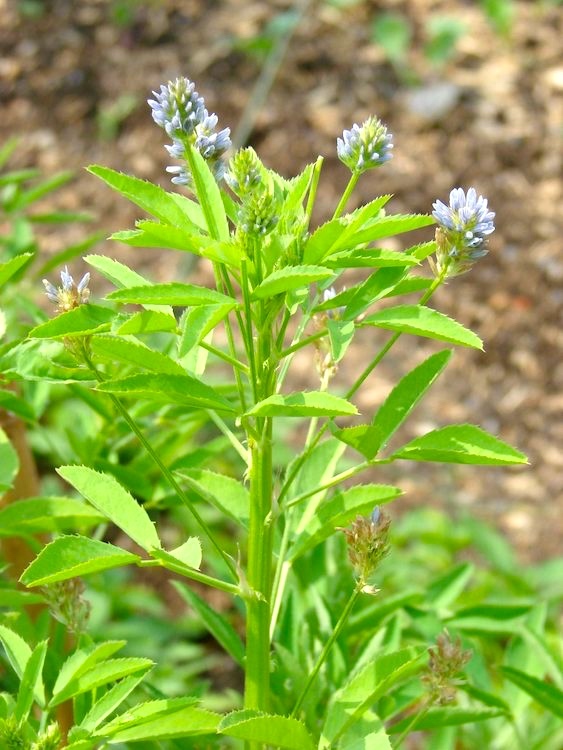 Trigonella caerulea (blue fenugreek) is an annual herb in the family Fabaceae [the legumes, or the pea / bean family]. This entry was posted on June 20, 2018 at 4:23 pm and is filed under Language and food, Language and plants. You can follow any responses to this entry through the RSS 2.0 feed. You can leave a response, or trackback from your own site. As I like cheese, I thought I would search for sources of Schabziger here. Amazon has it. More than that, it has a specialised grater into which a cone of Schabziger fits. So I ordered one cheese and one grater. I do hope I like it. Further to my comment, the Schabziger and grater arrived a few days ago in a Styrofoam box with a cooler bag in it (the ice had melted but the cheese was still cool). I put the cheese in the fridge and the grater in the cupboard. Today I had some gnocchi with butter, and thought that would be the perfect excuse to try the Schabziger. After wrestling with the grater for a while, I got it working and grated some cheese on the buttered gnocchi. It was…interesting. It’s an adult taste, certainly. I did enjoy it, and I’ll try it the next time I have pasta with butter. I have a picture of the grater with cheese in it, but have no idea whether I can paste it here. A very carefully framed appraisal, Chris.